BRUSSELS, Belgium – On the occasion of presenting credentials to President of the Portuguese Republic His Excellency Mr. Marcelo Rebelo de Sousa as non-resident Ambassador, His Excellency David T.A. Hales paid a courtesy call recently on Mr. Gonçalo Teles Gomes the Vice-President Camões Institute of Cooperation and Language. Camões Institute is the Agency which the Portuguese Foreign Ministry has delegated responsibilities for international cooperation and the promotion of Portuguese language and culture abroad. The two exchanged views on projects developed and funded by Camões Institute in areas of Cooperation in Language and Culture. 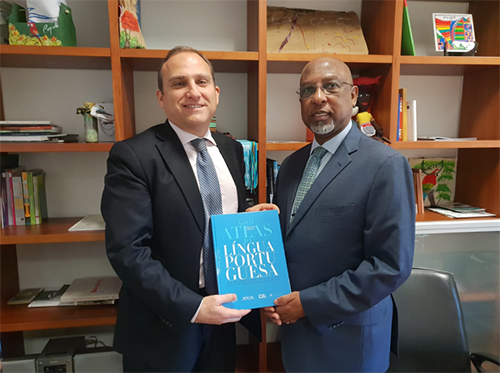 In relation to cultural exchange, upon being advised by Ambassador Hales about the Caribbean’s Festival of Arts (CARIFESTA), Vice-President Gomes indicated that Portugal would look favourably on an invitation to participate. Ambassador Hales also inquired about the possibility of the Portuguese assisting in teaching Portuguese as a foreign language in Guyana. To this end, Vice-President Gomes said the Institute was open to finalising an agreement in the promotion of Portuguese language and culture abroad which could involve a lecturer to teach at the University level and to conduct training for Foreign Service Officers (FSOs).